May 20, 2013 - Bombardier Aerospace announced that it has expanded its leading Challenger family of business jets with the addition of the new Challenger 350 aircraft. The Challenger 350 jet was launched, with NetJets as the worldwide launch partner, at a special event at the European Business Aviation Conference and Exhibition (EBACE) in Geneva, Switzerland. 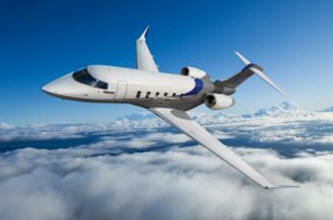 Deliveries of the aircraft are expected to begin in 2014. "The Challenger 350 jet will take our existing Challenger family to new heights," said Steve Ridolfi, President, Bombardier Business Aircraft. "This aircraft further enhances our leading business aircraft portfolio and will provide our customers with redefined design standards. Passengers will experience new comfort levels as they relax in the completely new cabin, enjoy a purpose-built and intuitive cabin management system and increase their efficiency with superior performance, and all at best-in-class operating costs. There is simply no substitute for a Challenger jet." "Designed to meet the ever growing needs of our customers, this new aircraft reflects the feedback received from our existing Challenger customers. Based on our owners and operators' needs, we have taken the world's bestselling super midsize jet and further increased its capability to better meet the growing requirements of our ever expanding Challenger customer base worldwide," added Mr. Ridolfi. The Challenger 350 jet will offer increased performance from the new twin Honeywell HTF7350 engines, each producing 7,323 lbf of thrust and reduced emissions, increased aerodynamic efficiency with its new canted winglets and will fly eight passengers 3,200 nm. The Challenger 350 jet boasts an impressive direct climb to 43,000 ft.
With a flat floor and the widest cabin in its class, the Challenger 350 jet features an entirely new interior, that lets even more natural light into the cabin with larger windows, resulting in a jet that offers passengers state-of-the-art cabin comfort, technology and productivity. Featuring Lufthansa Technik's next generation nice HD cabin management system, the cabin includes a complete redesign of the way passengers control the cabin environment, complemented by contemporary seat design, a new modular galley and the industry's most advanced sideledge featuring an authentic metal trim, a first in business aviation cabin interior design. The Challenger 350 aircraft's cockpit will feature Rockwell Collins Pro Line 21 Advanced. Features of the new avionics include, among others, synthetic vision, dual inertial reference systems, a completely paperless cockpit and Multiscan Weather Radar. The new avionics will provide pilots with increased situational awareness and reduced pilot workload.